The Dental Wing of King George's Medical College started as a part of ENT Department in 1949 with Dr. B. Sampat in charge. It shifted to separate premises as Department of Dentistry in 1952. The department made steady progress with constituent sections of different specialties offering comprehensive dental care to patients under the stewardship of Prof. TN Chawla who succeeded Dr Sampat. The Dental Department became a full fledged separate faculty in 1980 with the 6 respective sections serving as independent departments. The Faculty of Dental Sciences also made significant contributions in the field of research. A research unit in Periodontology was established under Prof TN Chawla by the Indian Council of Medical Research, New Delhi in 1965. Fluoride Study and Oral Prophylaxis Study units were established with PL480 grants. In 2002, King George's Medical College was upgraded to a Medical University and the Dental College was a constituent college of this new university. However, a year later in 2003, the dental college was upgraded to a separate university by the then Chief Minister Shri Mulayam Singh Yadav. The new dental university was the only one of its kind in India and one of only 4 dental universities in the world. Prof CP Govila was appointed as the 1st Vice Chancellor of this new university on 22nd May 2004. The university status was reverted to the Faculty of Dental Sciences under the King George's Medical University in 2007. At present, there are 9 departments, with an annual intake of 70 BDS students and 27 MDS students. Besides the BDS and MDS courses, certificate courses in Dental Hygiene and Dental Mechanics are also offered with 20 seats in each course. At present these courses are stopped by court order. Each department is equipped with the latest dental armamentarium. The institution has till date trained about 3300 graduates and 1200 postgraduates. Faculty Research Publications: 210 in peer reviewed indexed national and international journals. Certificate of excellence in Biomedical Waste Management System to Dept of Pediatric and Preventive Dentistry. Only center in India for Gold foil restoration. 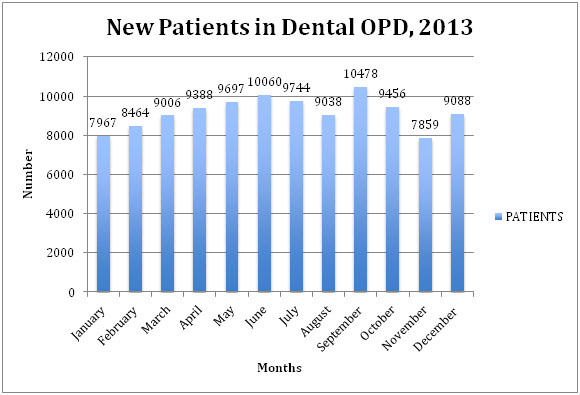 Patient Statistics: More than 1 lakh patients were treated in the Dental Faculty in 2013.